Lindbergh Peformed a great game in net VS Chicago Blackhawks.Flyers won 6 to 2. This sadly turned about to be the last game. Flyers played a game against the Boston Bruins. Lindbergh played a number of unbeatable games, Keenan gave Pelle a break and had the night off. 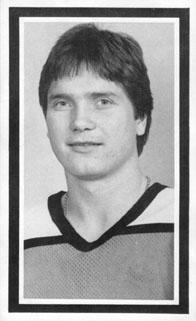 Bob Froese was place in the net. The Flyers won 5 to 3. When the game was over, Lindbergh drove home to King's Grant in Marlton, New Jersey. He soon received a phone call, teammates invited him to join a team party over at the restaurant/bar adjacent to the Flyers practice facility. Not only were many of Flyers players there, so was a man named Ed Parvin, who was a friend of many flyers players.Parvin's father was the real estate agent who sold many of the players of the team their houses.Ed Parvin visited Pelle in Stockholm the summer that just pasted.Pelle kissed his girlfriend Kerstin Pietzsh goodbye and told Kerstin that he was going to the Coliseum for a while. Leaving the sedan at home, Pelle went off to meet his teammates and friends at a party in his Porsche 930 Turbo. The party went well on into November 10th sunday morning. Parvin and a female companion, Kathy McNeal, had gotten a ride to the Coliseum nut did not have a way to get home, Lindbergh offered to take them home. at 5:30 am, Lindbergh's impaired judgment, he had a tendency to push the pedal to the metal.The Porsche failed to negotiate a steep curve and slammed into a wall in front of a school in Sommerdale, New Jersey. The collision was so violent that the entire hood of the car was pushed into the driver's side. Pelle was rushed to the hospital.He was place on a respirator. There was no signs and chance that Pelle would recover. The respirator was left on until Pelle Lindbergh's father arrived from Sweden. After his parents said their final farewell to Pelle at the hospital,They decided to have life support turned off. They Signed papers to have Pelle's organs donated His heart, liver, kidneys and corneas were donated. November 11th is when Pelle was pulled of life support and pasted away. 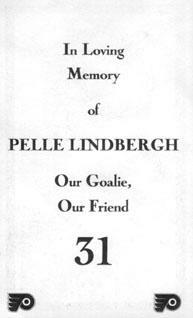 Pelle's American funeral was held at the Gloria Dei Old Swedes' Church in Philadelphia The next night, the Flyers held a special tribute to Lindbergh before their game against the Edmonton Oilers. After the game, Sigge Lindbergh, who could not speak English, conveyed his feelings by going around to every one associated with the team, looking them in the eyes and shaking their hands. Pelle's locker space was left empty for the rest of the season, a small Swedish flag placed atop it. The next night Pelle was shipped to Sweden for his 2nd funeral and burial. Pelle Lindbergh is buried in Södra Skogkyrkagården The cemetery is located in southern Stockholm. at the game following Pelle's death the game tickets featured his image on the ticket.